Kraan is alive & well. They have toured both year 2000, 2001 and 2002. see 'events' for coming concerts and broadcastings. Photos from show in Ulm (year 2000) here and review here. Several radioshows and TV-shows have also been broadcasted. Write to: Kraan, c/o hattler, postbox 2226, D-89012 Ulm Germany , or send a mail here - Festival arrangers for 2001 are welcomed. Hellmutt Hattler has basicly worked with Tab Two from 1991 to 2000. Tab Two is having a break now. Possibly a permanent break. He is now concentrating on Kraan and his band 'hattler'. Hattler has (autumn 2000) released the album 'No eats yes', and another will be released in 2003. He lives in a house nearby Ulm. He has also made a teaching book about Bass playing. Book Hattlers band 'Hattler' through the agency A.S.S. in Hamburg. Email 'Mick' for contact. Peter Wolbrandt lives in Sontheim, works with multimedia production and programming, and has, among other things, made a CD-ROM about the town Ulm together with his brother Jan Fride. On his website http://www.wolbrandt.de/ you can hear some new samples of Peters recent musical work 1997 - 1999. He released a cd in may 1999 'Under An1x' , a kind of technomusic - can be purchased through his website. In july 1999 a mpeg/video cd-rom with a Kraan koncert from Tuttlingen 1987 was made. Jan Fride (Wolbrandt) - Is running a headshop called OKAY together with his girlfriend through 21 years Willa (they have a daughter with the same age), selling all sorts of things. He made a website for the shop. Here is also soundsamples of music he has made during the last years. Some of it is a collaboration with peter Wolbrandt - mostly in the techno vein. Johannes Pappert (Alto). Alto lives in Berlin, ownes a sound/light hiring Company (that has a website - http://www.mixed-media.de/ choose the German version ). He still plays the sax ! Joo Kraus mostly works with Tab Two. A search at Klaus Kuhnke's archiv will show several recent cooperations. Ingo Bishof - Has worked with many bands/musicians and styles (try the Klaus Kuhnke's archiv). 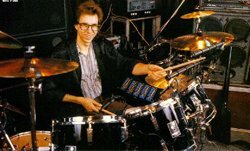 Played a long time with " Heiner Pudelko" and after his death with "Carsten Schmelzer & Band". He also played in a band called TAVIL (with Butze Fischer & Günter Reger). Released an album 2001 : Reger/Bischof/Fischer: Images of Trance and Rythm (DA Music- 5284 Selected Sound). Is curently working on a soloalbum. Gerry Brown - (webpage at http://www.drummerworld.com/ ) - a search at Klaus Kuhnke's archiv reveals more than is relevant for this website. 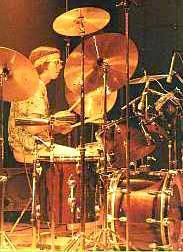 He is (among other things) known for playing drums on Stanley Clarke's Schooldays album. Mark McMillen - I have no info at all (heard that he played in Khartago with Ingo).